Brown Sugar Backpackers i Johannesburg, Sør-Afrika: Bestill nå! We require a 50% booking deposit to secure reservation of groups. See our online reservations and cancellation policy on our web site. This very spacious, comfy, safe and secure 'Ex-Mafia' mansion was built in the 1970's by an infamous drug lord. When the Godfather moved out the backpackers moved in and they made this castle their home since 1999. The current owner (since 2005) has made many renovations and improvements to the hostel to accommodate all types of travelers. We have everything you need and keep improving our facilities and services because the owner is an experienced traveler herself. 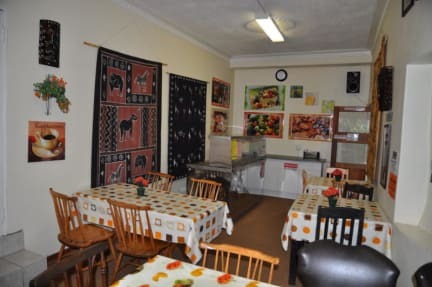 FREE buffet type BREAKFAST is INCLUDED in the rates and consist of: Eggs, bread, jam, cheese, side dishes (tomato/cheese/mushrooms/cold meat/baked beans/etc), fresh fruit, cereal and muesli, yogurt, fruit juice, tea and coffee. On selected days we have freshly baked muffins and other surprises. Breakfast is served from 07h00 to 10h00 daily. Note: Should you depart before 07h00, we will provide a take away breakfast for you. FREE Wi-Fi and guest stations with fast FIBRE internet launching in APRIL 2018. Use your own device, get the code, log on and share your African experience with your friends and loved ones back home. Wall HEATERS and FANS in all the rooms with international plugs to charge your electronic devices for Europe, USA, Asia and where ever you come from and we sell adapters at reception. private room also have electric blankets to keep you warm in winter. You will always have HOT water and be able to cook and stay warm during the colder months because the whole property runs on natural under ground gas, which is much safer than LPG or bottled gas. Reception open from 07h00 to 22h00 on weekdays anb extended to 23h00 over weekends. The bar area will remain open until 00h00 or later, depending on the vibe and guests. We sell mobile/cellular airtime vouchers for your mobile phone for all local networks (Vodacom/MTN/Cell C) so you can stay connected in Africa. We are a haven for people who prefer to do their own thing. You will experience a next to home feeling at our establishment and never feel crowded or boxed in, unless you want to join in on the action. The property stretches over 3000 square meters and set on a variety of levels with a sparkling swimming pool at the top of the hill. The well-stocked bar doubles as a reception after 22h00 in the evening. You can book all your transfers, car hire, Baz Bus and Mzansi tickets (Hop on Hop off Bus), pub lunches, dinners, and tours to Soweto, Apartheid Museum, Kruger National Park and the big bad city center. We have our own drivers and vehicles due to the poor public transport in Johannesburg (South Africa) for your convenience and offer transfers at the set rates. Download the UBER APP on your phone and make use of them for the cheapest option. Public transport 200m from our gate or use Meter taxi's, which is often expensive. We will match or beat any meter taxi rates. We are 5 minutes from Eastgate International Shopping Mall, which contains all the major banks, shopping, eating and cinema facilities you could ever want. Across the road from the mall is Food Lovers Market. Markets of the world is on the same route and you can buy cheap African Art & Crafts and souvenirs for your friends and family before you fly out. The staff at Brown Sugar are specialists in advising travelers on the best and quickest ways to obtain visas for countries such as Mozambique and Zimbabwe and, on request, we take our guests to the relevant embassies and help them with application forms and photographs and more. For those travelers needing visas for Angola, the embassy is within walking distance of the house. Brown Sugar has all the amenities and facilities you would expect. We have a large kitchen with a gas stove and all the crockery, cutlery, pans and pots to whip up and enjoy your own meals. Free tea and coffee served at breakfast and again from 17h00-22h00 daily for our guests. We offer pub lunches (truly South African)between 11h45 and 13h45 daily and prepare fresh home cooked dinners every evening and served between 19h00 and 19h30 and very popular with guests and we cater for vegetarians. Vegetables and salad served with all dinners. Relax at the sparkling swimming pool and soak up the African sun for a golden brown tan to show off to your friends when you return home (Northern hemisphere). The swimming pool terrace, rooftop and bar patios offers some of the best views of the Eastern suburbs. Browse our web site and go to the ACTIVITIES page to view all the tourist attractions, clubs and activities in and around Brown Sugar and or Joburg. We have added active links for your convenience to view, read and plan your trip in advance so that you don't miss a beat while on holiday in our beautiful country. 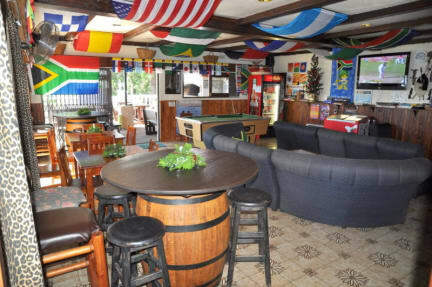 We have an ELECTRONIC BOOKLET with all the facilities on what is on offer at Brown Sugar Backpackers Lodge.